Re-invigorate! Awaken your senses with the fresh and fabulous hues of spring. As we anticipate the season's first blooms, we colorize our latest look book with bursts of beautiful bedding for your home, courtesy of our ever-evolving designers' interpretations of Spring. Each page offers a peek at patterns and hues fitting for today's diverse tastes. 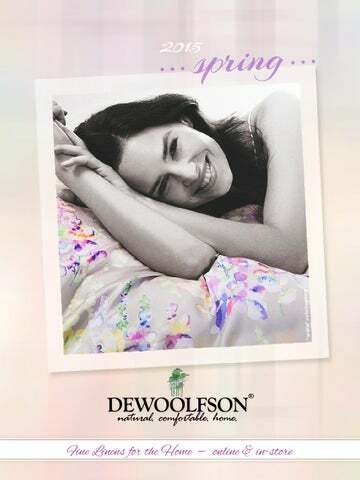 Not to be missed are our own-make down pillows and comforters and DEWOOLFSON'S signature duple silk bedding. There is so much that goes into making a lovely bed and we believe it all begins with perfectly filled and stitched down and silk fillers. If you are eager to learn more about any of the linens you see on the following pages, click on the image and you will be taken to that page on our merchant website dewoolfsonlinens.com. We hope you find our Spring look book to be delightful and positively motivating.